This week we had a great conversation on a topic that is a hot button issue for many propane and delivered fuel providers which is tank monitoring integration with their back office! The On-Demand version of How to Integrate Tank Monitoring with Your Delivery System is available for sign up! We were thrilled to have industry experts Roger Keyser of ADD Systems, Phil Mirabito of Mirabito Energy Products and Tank Utility’s own Aaron Gress talk about this important topic. We received a ton of interesting and important questions from the audience on tank monitoring and key integration best practices. The first question we received a lot of interest in was the Tank Utility Propane Delivery History Analysis and how to get a free analysis. How do you run a Delivery History Analysis? Is this through ADDs or Tank Utility? Great question! A Delivery History Analysis uses your own back office data to identify customer tank accounts where inefficient deliveries could be avoided. 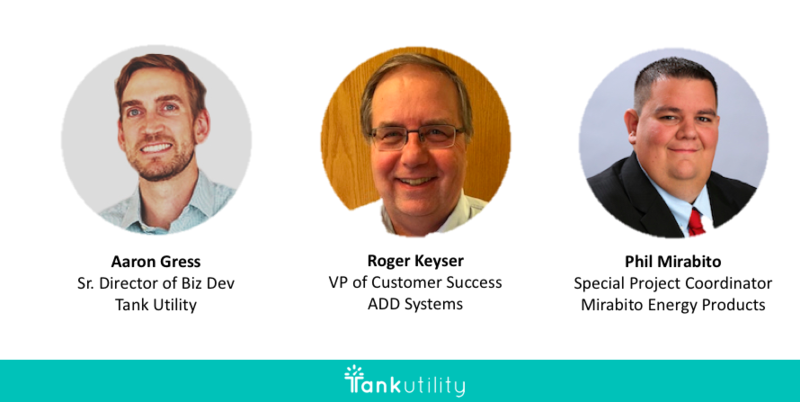 The Tank Utility team works with delivered fuel providers to pull the right data from their ADDs or another back office system and then analyzes the data to create a personalized assessment of your delivery efficiency. The report is a tremendous free resource you can use to optimize your deliveries and drive higher margins per customer. Does the Delivery History Analysis cost anything? Sign Up for A Personalized Delivery History Analysis! Do tank monitors have applications for oil tanks, not just propane? Of course! Tank Utility tank monitors can work on many different types of tanks, oil tanks included! Delivered Fuel providers can use our monitors on tanks up to about 10ft in height. How do you justify the budget for a tank monitoring initiative? On the webinar, Phil Mirabito discussed his experience in determining return on investment for tank monitors. He approached the decision as an investment in reducing delivery inefficiency that would lead to the tank monitors paying for themselves. Most importantly, he stressed the need to measure ROI pre- and post- deployment of your tank monitors to ensure that you are getting the most ROI out of your investment. Outside of the hardware, what should I be looking for in a tank monitoring solution? Phil also had some good advice on choosing the right tank monitoring provider. For him, it wasn’t about the device but the partnership. He stressed the importance of choosing Tank Utility not only for the ease of use of the technology but also in the great day-to-day relationship he has with the team from helping with the ADDs integration to identifying what customer accounts to launch the tank monitoring program through the Delivery History Analysis. There was also conversation on looking for Complete Tank Monitoring Solutions that focus not just on Hardware but also on the Software Analytics and Consumer-Facing Propane Tank Monitoring Mobile App. For the Mobile App, can the customer see the % in tank as well, or they just call in to get that info? The Tank Utility solution uniquely includes a mobile app that you can pass along to your customers. While optional, this is a tremendous value to building better relationships with you customers and it greatly reduces the support time you spend on call-ins from customers checking on their tank. When you set up a customer with a tank monitoring you can also have them sign up for the mobile app where they can view the real-time view of their tank level and set their own alerts. Best of all, this mobile app can be branded with your logo for continued brand recognition with your customers. Customers will only be able to see the level of their own tank. Can I sell monitors and mobile app to my customers? What is the benefit of this? Absolutely! Many fuel providers do this with our solution either as a value add to close a sale or an ongoing service to give customers peace of mind. It’s become a critical part of winning new business for those customers, whether they include it for free or charge. Tank Utility also helps customers with the marketing to their customers providing white labeled marketing materials, web banners, door hangers and landing pages at no additional cost. Where can I get the marketing and webpage information to assist in selling? If you are interested in selling to your customers, feel free to reach out to us at info@tankutility.com. We will get back to you quickly about how we can help! Why do some of our monitors show “shipped” instead of “deployed” in portal? We have reset them, but it still shows with no readings. Deployment of tank monitors is by far the biggest bottleneck to return on investment. With tank monitors from Tank Utility, monitors that show as “shipped” have not yet successfully sent a reading. Once activated, their status will automatically flip to “deployed”. How does the integration work and is there an additional fee for this? Today, Tank Utility provides free integration to customers looking to integrate tank monitor data with their back office system. Depending on your back office provider, there may be a fee on their side. What is the usual battery life on Tank Utility units? Is the battery field serviceable and if so what is the replacement cost? Tank Utility monitors have a battery life of 3-5 years based on normal usage. Our monitors have also been built to enable easy battery replacement. The batteries are your typical AA size lithium batteries that you can replace in the field with nothing more than a phillips head screwdriver. Get Your Free Fuel Delivery History Analysis! 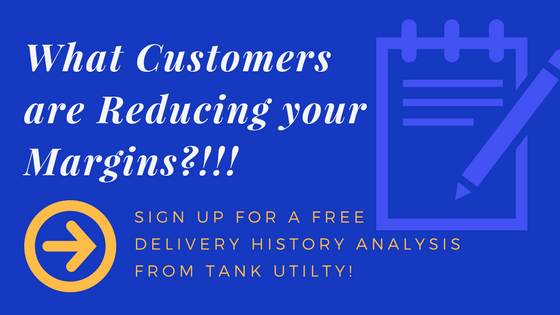 If you are interested in working with Tank Utility to get a personalized delivery history analysis, reach out to us!